This fabulous penthouse apartmentis truly extraordinary. It is located in one of Barcelona’s less touristic neighbourhoods, but is still just 15 minutes maximum by metro from the city centre. With stunning views of the city - and you can also see the sea - this three bedroom apartment is ideal for those looking to stay in a modern, comfortable space, away from the hustle and bustle of the Old Town. Nearby you’ll find the Guinardó Park and the wonderful Modernist attraction at the Hospital de la Santa Creu i Sant Pau. There apartment has a modern décor with a large living space and access to a balcony, complete with table and chairs. 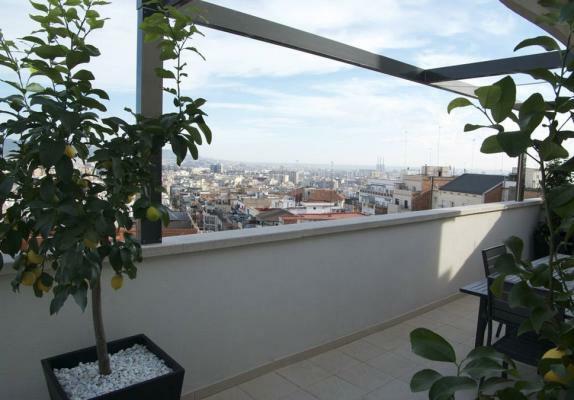 There is also a private terrace, perfect for soaking up that Mediterranean weather. The living room has a TV with satellite, a seating area and a dining space. There is also a WiFi connection, allowing you to stay in touch with friends and family at home. The state of the art kitchencomes fully equipped with everything you’ll need to prepare your own home-cooked meals. There is also a breakfast bar, ideal for enjoying your morning coffee. The three bedrooms have a double bed each, and there are two bathrooms in the apartment, one with a walk-in shower, the other with a bath and shower combined. يقع حي أورتا غيناردوHorta Guinardó في الشمال الشرقي لبرشلونة وعلى مساحة 12 هيكتار. هو أحد أكبر أحياء برشلونة التي تتميز بالهدوء على عكس وسط المدينة الصاخب، ويتميز أيضًا بشبكة كبيرة من المواصلات العامة ومترو الانفاق. يعرف أورتا غيناردو بالرئة الخضراء لبرشلونة لأن جزء كبير منه يقع في سلسلة جبال كويسرولا. وسنجد كذلك حديقة متاهة أورتاParc del Laberint d’horta المشيدة في نهاية القرن الثامن عشر وتحتوي على متاهة نباتية مكونة من 750 شجرة سرو. إذا كنت تبحث عن الهدؤء خلال إقامتك ببرشلونة، دون الإبتعاد عن معالم المدينة فإن إختيار شقة أورتا هو الحل الأمثل سواء للعائلات أو لمجموعة من الأصددقاء.